7879 Hoth Echo Base is a set released in 2011 of the Classic Star Wars line. 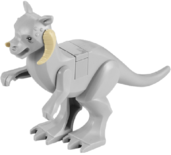 It contains many similar things that were used in the 7749 Echo Base set such as the tauntaun and the E-webb. The set can connect at the back to make a smaller base, or can unfold to become larger. This Hoth Echo base set is the largest Hoth Echo base set yet. Notable features include the ability to open and close the base itself, rotating radar dishes, icicle booby traps, rotating guns and missile launchers, a working cargo crane, a small medical center along with a Bacta tank and a Tauntaun stable. The minifigures included with this set are: a 2-1B Medical Droid, R-3PO, Luke Skywalker (Bacta), Han Solo (Parka), Princess Leia, Chewbacca, two Snowtroopers and a Tauntaun. The Hoth Echo base was a base used by the Rebel forces shortly after the Battle of Yavin. It was destroyed shortly after the remaining transports evacuated the base, by the Rebel SpecForce Renegade Squadron. This is a description taken from LEGO.com. Please do not modify it. (visit this item's product page) Defend the Hoth Echo Base from the evil Imperial forces! Prepare for attack! Imperial forces have discovered the Rebel base hidden on the ice planet of Hoth and are preparing to crush the Rebel Alliance. Han Solo, Chewbacca, Princess Leia and protocol droid R-3PO get ready to fend off the attack as 2 snowtroopers approach. Luke Skywalker is in the bacta tank being treated by medical droid 2-1B. Expanding base features tauntaun stable with tauntaun, working cargo crane, 2 rotating radar dishes, icicle trap and speeder bike. Fire the flick missile gun turrets! Defend the Rebel Alliance with repeating blaster and blaster rifle weapons! Luke Skywalker in the bacta tank. Back of the Luke Skywalker minifigure. The set with a stylized background. Facts about "7879 Hoth Echo Base"
Defend the Hoth Echo Base from the evil Imperial forces! This page was last edited on 15 March 2016, at 06:11.